We all know about the long-term damages caused by UV radiation, but few have heard about the damage caused by infrared radiation. When the skin heats up, micro-traumas occur that affect the structure and function of the skin cells. Light skin will respond to structure related changes (development of solar keratosis and lentigo), and dark skin that tends to lean towards pigmentation will have spots that become warmer (like black clothing in the sun); this warming will lead to darkening of the stain on the skin’s surface. Not many are aware that sunscreen protects us for a maximum of two hours. In other words, if we apply sunscreen in the morning we are not protected by noontime and are exposed to skin damage due to exposure to the sun. As it is currently not possible to renew the sunscreen on top of makeup, pigmentation spots get darker and the skin continues to be damaged by the sun. In order to protect the skin throughout the day, Noon Aesthetics has developed the mineral powder for protection against the sun, which enables renewing the protection at any time and place, even on top of make-up! 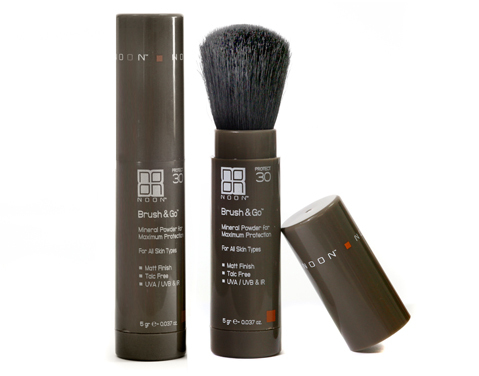 The mineral powder is transparent and protects against the entire radiation spectrum (UVA and UVB). It comes in a convenient container, with a brush at its end. It is important to note that the SPF factor in sun-screens indicates protection from UVB rays, but does not indicate protection from UVA which wears off after only two hours. It is important to ensure that the sunscreen protects against UVA rays and to renew the protection after two hours at most. UVA radiation is related to complex pigmentation disturbances, to the production of free radicals, to injuries to collagen and skin-aging, and to skin cancers. It is also important to protect the skin in the winter, especially in sunny countries.